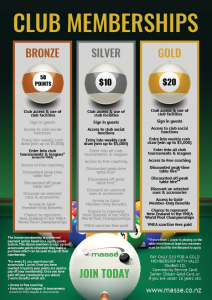 Massé has made it even easier for you to play more pool! Become a Gold member and pay only $2/hr at Massé Hawera, Glen Eden and Pukekohe every Saturday and Sunday between 10 am & 4 pm! New Membership Year! – Monday 18th March! The new membership year starts Monday 18th March! Head down to your local Masse and sign up for your 2019 membership. Sign up as a Gold Member and gain complete access to what the club has to offer!